Fun, excitement and exhilaration! Explore the spectacular Albany coastline on the Gemini Waverider RIB, when the thrill of getting there quickly means seeing more as well. A great boat dive fully protected from the hard easterly winds. Walls and swim throughs, a great site for small colourful fish which live on and around the many vast plate corals. 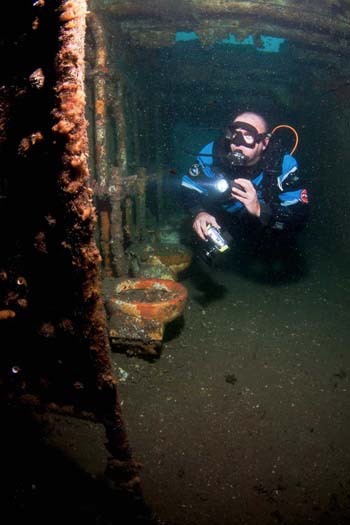 HMAS Perth is a “must dive” when you visit Albany. Permits are required and can be obtained from Albany Dive, South Coast Diving Supplies or The City of Albany. Thanks to Jamie Kiddle from Beyond the Surface Photography for these photos. Check out their webpage. Paragliding takes place at Shelley's Beach, Mutton Bird Island or The Wind Farm. Book yourself in for a tandem flight. The peak of Bluff Knoll in the Albany Region can be reached by following a well formed bush track but it does require a reasonable degree of fitness. It takes about four hours (weather and fitness level permitting) to complete the six-kilometre return climb using the pre-formed track. Best time to visit is late spring and early summer (October to December) Winter, between June and August, is cold and wet. so come prepared. Even in spring the weather can be unpredictable, particularly higher in the range. Sudden cold changes cause the temperature to drop and rain or hail to set in. All visitors are strongly advised not to enter the bush or use footpaths on days of extreme fire danger. During spring there is an awesome display of wild flowers. Castle Rock in the Albany Region is a tourist attraction in the Porongurup Range There is a walk trail to the summit which offers 360 degree views, 570 metres above sea level. The walk also takes in the Balancing Rock, a six metre high granite boulder which reportedly weighs around 186 tonnes yet rests on a base just 1.21 square metres. A new walkway and viewing platform has recently been completed. This is a strenuous 16 kilometre return hike over Isthmus Hill and Limestone Head, finishing at Bald Head. It starts near the Salmon Holes. The challenging hike offers spectacular views of our stunning coast, is a good place for spotting whales and there are some trails down to the beach. It will take between six and eight hours and requires a good level of fitness.